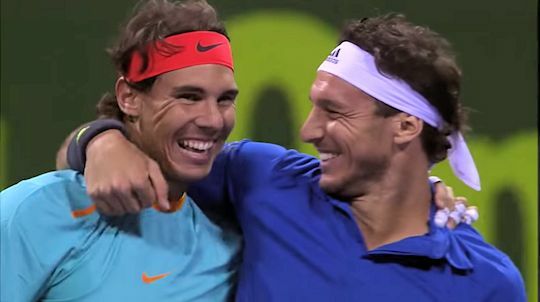 At the beginning of this week it didn't look like we would have anything to celebrate when Rafa lost in the first-round to Michael Berrer, 6-1, 3-6, 4-6. He played really well in the first set and it looked like it would be a breeze but then things started to fall apart. There were flashes of classic Rafa like this amazing banana shot. "I think I play a great first set...but at the end I had a bad game in the third one, fourth one of the second set. He break me. After that everything changed. He played well. I was playing with more nerves than usual after—as I said before, after long time I wanted to win. I know that winning a couple of matches here will help me. So that makes me play a little bit more under more tension. Comebacks are tough; I’m not an exception." We were left to cheer him on in the doubles where he was partnered by Juan Monaco. Of course, this wasn't televised so we had to rely on the live scoreboard to see them win their first couple of matches. They defeated Simone Bolelli and Leonardo Mayer, 6-6, 6-3, in the first round but had a bit more trouble beating Benjamin Becker and Artem Sitak in the quarter final. They finally prevailed, 2-6, 6-3, 10-6. In the semi final they faced Novak Djokovic and Filip Krajinovic. Some were afforded a brief glimpse between matches on Centre Court. After a tight first set, they ran away with the match, 7-6(3), 6-1. Eurosport decided not to bother showing the final but luckily there were plenty of places to watch online. And how fabulous it was. Their opponents, Julian Knowle and Philipp Oswald, served really well initially and it looked like it could go right up to a tiebreak. But suddenly team Rafico got the break and wrapped up the first set. The second set was also nip and tuck until they finally broke to win the match, 6-3, 6-4. Here's the end of the match and trophy ceremony. 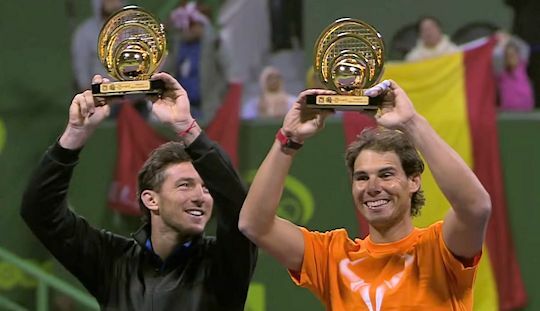 The win gives Rafa a 9th doubles titles - more than any other player in the ATP singles top 20. He is also the only non-specialist doubles player to have won the same doubles title 4 times in the last 10 years. Rafa was pretty pleased, posting the following on Twitter and Facebook. 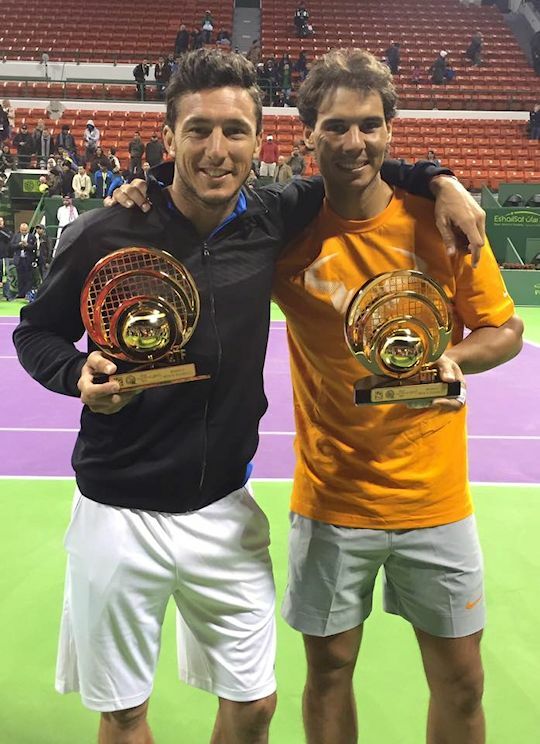 "Buen final de semana... Y aún más si es con un buen amigo Juan Monaco! Great end of the week... 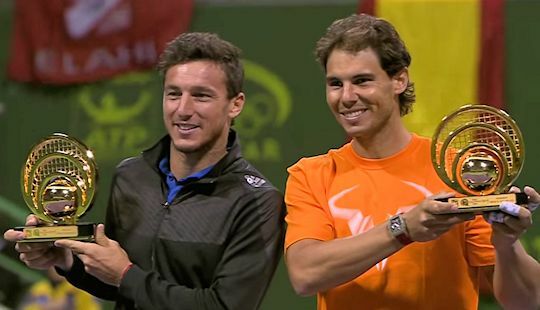 Even better with a good friend Juan Monaco!"